The Seaforth Highlanders of Canada are a militia unit (i.e. reserve army) and they parade in Vancouver, British Columbia at the Seaforth Armoury at 1650 Burrard Street. Membership in the Seaforth Association is open to all current and former Seaforths, and membership is encouraged. It is cheap too, at only $15.00 a year! Our WWII vets are now falling by the wayside and we need more Seaforths who have served in the post-war era to become active in the Association. The Seaforth Highlanders of Canada Regimental Museum is an officially recognized Canadian Forces Museum and it is located in the Seaforth Armoury. I started the museum in 1972 by searching the armoury for artifacts and archival material and then scrounged a room (former officers’ kit stores) over top of the Orderly Room. I spent 13 years as Curator on three separate “Tours of Duty”. This was all voluntary and my wife Jeanette helped. The last “tour” of duty as Curator was 2008 June 04 to the summer of 2011. By the time I left the collection had over 7,000 items and the museum was officially recognized as a Canadian Forces Museum. A regimental history came out in 1920. HISTORY OF THE 72nd CANADIAN INFANTRY BATTALION, SEAFORTH HIGHLANDERS OF CANADA by B. McEvoy and A. H. Finlay. Publisher Cowan and Brookhouse, Vancouver. In 1969 Dr. Reg H. Roy wrote another history that covered the rest of the history to 1965. Captain Colin Stevens’ Glengarry & cap badge. This Glengarry was worn by my father, Lieutenant A. H. Stevens from 1943 – 1944 in the Essex Scottish and by me from 1969 onwards in the Queen’s Own Cameron Highlanders of Canada, the Seaforth Highlanders of Canada and the Canadian Scottish Regiment (Princess Mary’s) . My Glengarry with my solid silver officers’ cap badge. The badge is a very old one, which I acquired used in 1970 when I transferred in as a 2/Lt from the Queen’s Own Cameron Highlanders of Canada. 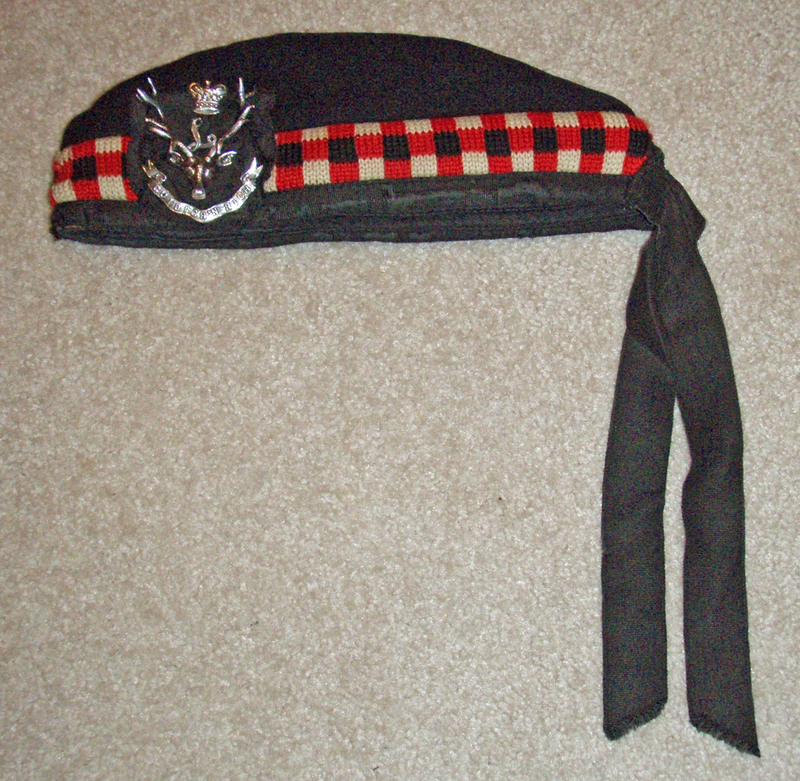 The Glengarry was worn by my father in 1943 with the Essex Scottish Regiment in the UK. 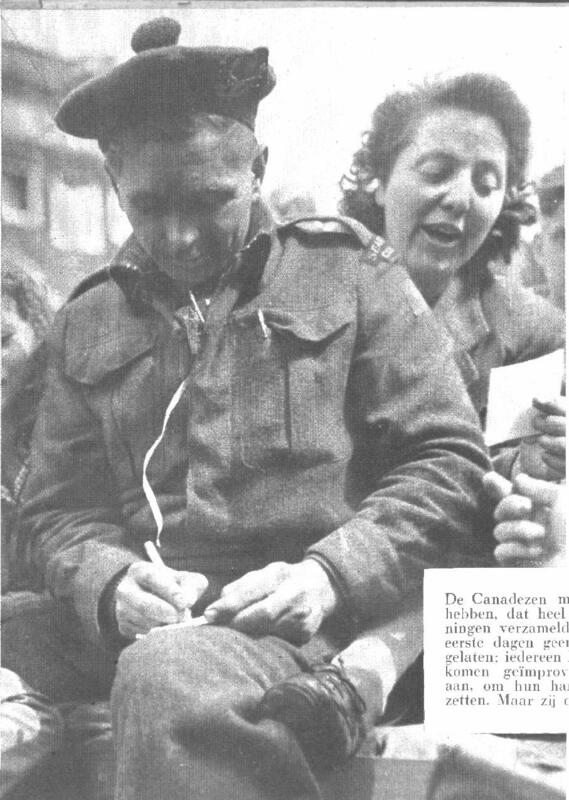 Seaforth Highlanders of Canada during the liberation of Holland festivities, May 1945.
Who are these men? Can anyone identify them please? 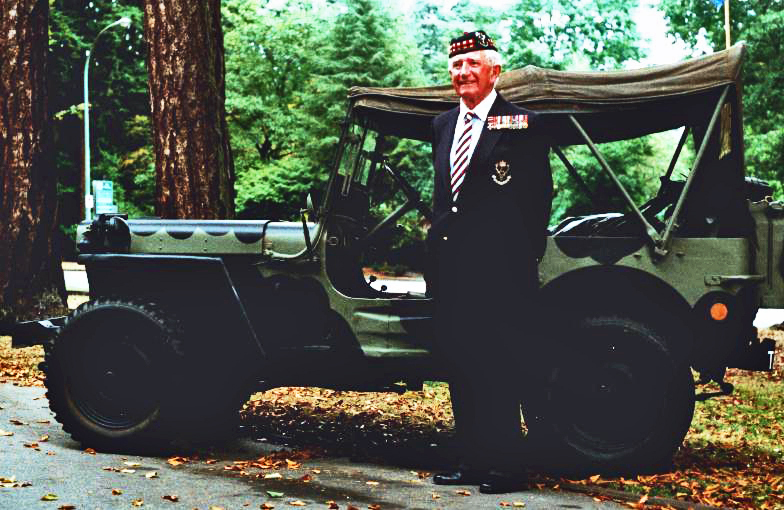 Brigadier H. P. Bell-Irving, Seaforth Highlanders of Canada, with Colin Stevens’ 1944 Willys MB jeep. Battle of Britain Parade, Stanley Park, September 2000. The regiment was established in 1910 in Vancouver, BC. They took the number 72 from the old 72nd Regiment of Foot, the Seaforth Highlanders, in Scotland. The cap badge was always the same for the officers I believe (solid silver, 3 dimensional, in 3 and 4 piece variations). In 1910, the Other Ranks had a round cap badge, but soon changed to the style we see in WWI – stag’s head, wreath and 72 between the antlers. In World War II the 1st Bn. 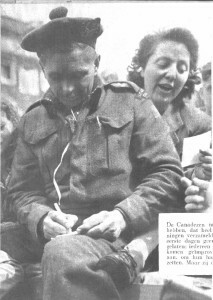 went overseas in 1939 as part of 1 Canadian Infantry Division and participated in the Defence of Britain. In 1943 they were part of operation Husky, the invasion on Sicily, and then the invasion of Italy. 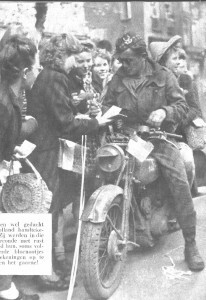 In 1945 they were moved to Holland along with the rest of the 1st Canadian Corps and reunited with the 2nd Canadian Corps as part of First Canadian Army for the liberation of Holland. In the 1950s the regiment sent a company to Germany to serve with NATO. Many Seaforths have served on attachments with the Regular Force on United Nations, SFOR and other duties. Some Seaforths were at the Battle of the Medak Pocket in the former Yugoslavia. Some are likely serving in Afghanistan now in the War on Terror. 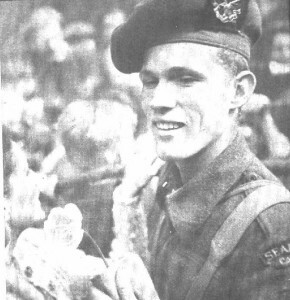 Canada’s last surviving VICTORIA CROSS winner was Private E. A. Smith who won this decoration while serving with the Seaforth Highlanders of Canada. Note that Veterans’ Affairs is using the WRONG Seaforth cap badge! The one shown is the issue one replacing the WWI 72nd CEF badge, BUT THE REGIMENT REFUSED TO WEAR IT! In the 1970s I showed one to Brigadier Clark who commanded the 72nd Bn CEF in World War I and was our Honorary Colonel and he said in effect – “That damned thing! Ottawa sent those badges out and we refused to wear them! Only the Officers and RSM wear the coronet and L.” This is the badge that is shown in most badge books – official issue but WRONG! Yes it is rare, and yes they were worn sometimes when there was a shortage of badges e.g. one of our officers wore one in the early 1970s because we did not have enough of the 3 dimensional solid silver cap badges to go around. I served in the regiment as an officer from 1970 to 1975, and then again in 1977. 2/Lt C M Stevens, Seaforth at Canadian Forces Base Gagetown 1972 August. There is another soldier in the photo as well. No, it is not Vietnam, though that war was ongoing for the USA at this time. 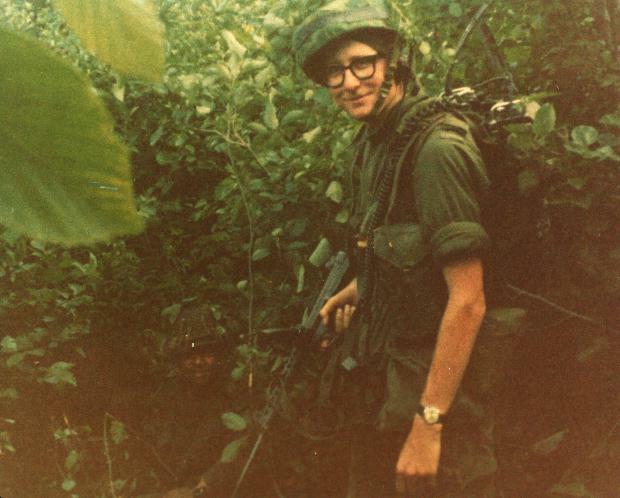 2/Lt Colin Stevens at CFB Gagetown (New Brunswick) in August 1972. I was on course at the time. I am carrying a PRC 25 radio set and a 9mm SMG C1 with bayonet fixed (for the “gung ho” look). Note that there is another soldier in the photo as well.